The Last Samurai (2003)After eight months of rigorous martial arts and katana training, Cruise climbed aboard a mechanical horse for a makeshift battlefield joust against co-star Hiroyuki Sanada. But an error in Sanada's mechanical horse caused it to stop farther than the crew intended, and Cruise's neck nearly collided with Sanada's sword. Decapitation? Who's to say. But would Cruise have broken his neck if that sword got any closer? Quite likely. Mission: Impossible II (2000)In one armrest-clutching shot, Ethan Hunt stops a knife from being driven right into his eye. When it was filmed, Cruise shocked director John Woo when he said he wanted to be involved in the shot with no special effects. Like "The Last Samurai," the blade is dulled, but it's attached to a cable to make sure that Cruise didn't need that "Valkyrie" eyepatch eight years in advance. Mission: Impossible: Ghost Protocol (2011)An instantly iconic action scene for both Cruise and the genre as a whole was Ethan's infamous attempt to scale the Burj Khalifa. While Cruise was harnessed, he climbed, dropped, and swung around the side of the half-mile high skyscraper for eight days to get the shots seen in the film. Jack Reacher (2012)Before working together on "Mission: Impossible," Cruise and director Christopher McQuarrie worked on this action film in which Cruise did all the car chase scenes on his own. Yes, even the parts where he's smashing into walls and other cars. Cruise went on to use his stunt driving training to power slide through narrow alleys in "Mission: Impossible -- Rogue Nation" while cameras attached to the windshield make it nearly impossible to see the road. 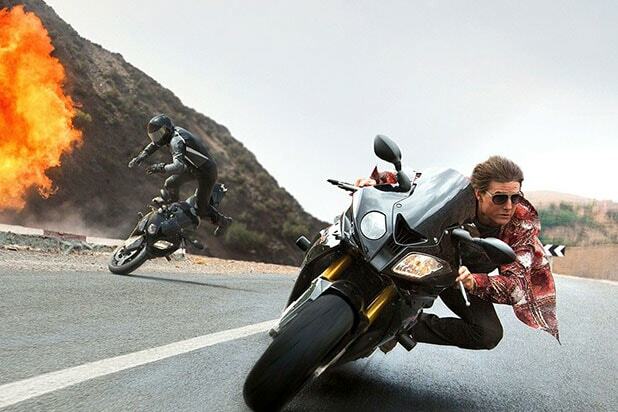 Mission: Impossible -- Rogue Nation (2015)That's not a green screen. While Cruise is attached by a safety harness that's digitally removed, he really is clinging to the side of a plane as it takes off. Cruise has said that between the g-forces of the takeoff and the wind blasting in his face, he nearly forgot to say his line while holding on to the plane. "Mission: Impossible -- Fallout" (2018)Now, in the latest "Mission: Impossible" film, Cruise goes from car chases to helicopter chases. In an interview with Graham Norton, Cruise says he spent two years getting his helicopter license and preparing for the scene, which involves a close range, low altitude chase through the mountains of New Zealand with co-star Henry Cavill. "There was a point where I genuinely thought... 'At least I get killed by Tom Cruise. That'll look good in the papers,'" Cavill said.